Website hosting is one of the most important factors that will make or break a website. This is because it is web hosting that decides how your blog or webstore responds to traffic. One of the most important factors of ranking on search engines is the website load time and at the same time, bounce rate increases drastically with every second the website is idle or still loading, because general users lose interest pretty fast and leave websites that load too slow. It’s very important to use a reliable company as your hosting provider, one with fast servers, great software and hardware and fast customer support to make sure that you won’t lose any reader or client. Siteground website hosting is one that would be able to provide you with all the features you are looking for. Having a response time of less than a second, this company will make it certain that your traffic gets a smooth experience while visiting your site. It is also highly user-friendly. Although the price of your hosting is very important, you shouldn’t give up on features and server capabilities for just a few bucks. Having this in mind, Siteground offers great features and professional services at very small prices. Keep in mind that this company isn’t offering $1 hosting plans that crash any time you have a burst of visitors. They offer professional services suitable even for big websites with a big visitor flow. 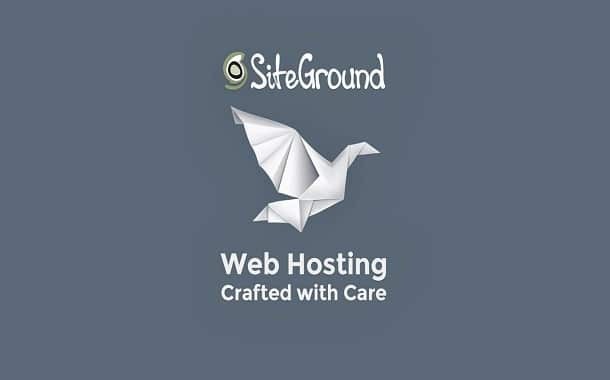 So let’s talk a little about the hosting plans offered by SiteGround. If you’re looking for a shared hosting plan, you have three of them to pick from. The StartUp plan, which is designed to provide you with a smooth start in the virtual world and can host small websites, can be acquired at the cost of $3.95 per month. This plan contains all essential features such as free domain, SSD storage, and free daily backup. It can be used for a single website and has the web space of 10GB. GrowBig is the next available plan, which is designed to host and handle medium webstores and blogs and is available for $7.95 per month. This plan contains all the essential features along with some premium features such as priority technical support and super cache. This plan can be used for multiple websites and offers 20GB web space. Lastly, you have the option of GoGeek, which is the plan for those who have or plan to build big websites with lots of visitors that consume a lot of bandwidth. This plan is available at $14.95 per month. This plan offers you advanced features in addition to the essential and premium features. This includes fewer accounts on servers and one-click Git repo creation among others. It offers 30GB web space, more than enough to host almost any website. Siteground also offers you cloud hosting, which is fast and manageable. Four plans are offered for cloud hosting. The first plan is Entry, which costs $80 per month. This plan offers you 2 CPU cores, 4GB memory, and 40GB SSD space. The next is the Business plan, which is available at the cost of $120 per month and offers 3 CPU cores along with 6GB memory and 60GB SSD space. Business Plus is also a plan offered by the company, which would cost you around $160 per month and would offer you 4 CPU cores with 8GB memory and 80GB SSD space. Lastly, you have the Enterprise plan, which is available for $240 per month and offers you 8 CPU cores with 10GB memory and 120GB SSD space. Dedicated server hosting is also a service provided by Siteground for which it has three types of servers available. The first type is the Entry Server, which costs around $229 per month and offers you 3.20 GHz CPU clock speed, 4 CPU cores, 8 CPU threads, and 8MB CPU cache among others. You also have the option of the Power Server that costs you around $329 per month with features like 3.50 GHz CPU clock speed, 4 CPU cores, 8 CPU threads, 8MB CPU cache, and 16GB DDR3 RAM. Lastly, you have the option of Enterprise Server that would cost you around $429 per month. This plan offers you features like 2.00 GHz CPU clock speed, 2 x 6 CPU cores, 2 x 12 CPU threads, and 15MB CPU cache. The company also offers the service of reseller hosting, which can cost you less than $42 per year and is suitable for multiple site hosting. Should the average working Joe host a website on SiteGround servers? The information we offered above might be overwhelming, especially for someone that is trying to host their first website. The bottom line is that SiteGround is a very reliable company offering professional services. How do we know? ThePricer is hosted at SiteGround! We have a few months since we moved from an unreliable hosting company. We launched ThePricer with a cheaper hosting, because we didn’t think it would even matter. But in time, as we started to get more and more daily visitors, we noticed that the hosting just couldn’t support our website. It would show server errors and slow load times especially during peak hours, when most of our visitors tried to read our articles. And worst of all, we could never find their support staff to get them to fix our problems. As soon as we moved to SiteGround all of our problems disappeared and our website now loads in under 2 seconds. But don’t take our word for it, try it yourself! This should be enough to convince you to move your website at SiteGround. How Much Does a Santa Costume Cost? How Much Does a Christmas Vacation to Prague Cost?